My photo essay explores the evolution of public markets as an early indication of that shift. This photo essay is about the role of public seating in nurturing human relationships and a healthier state of mind. 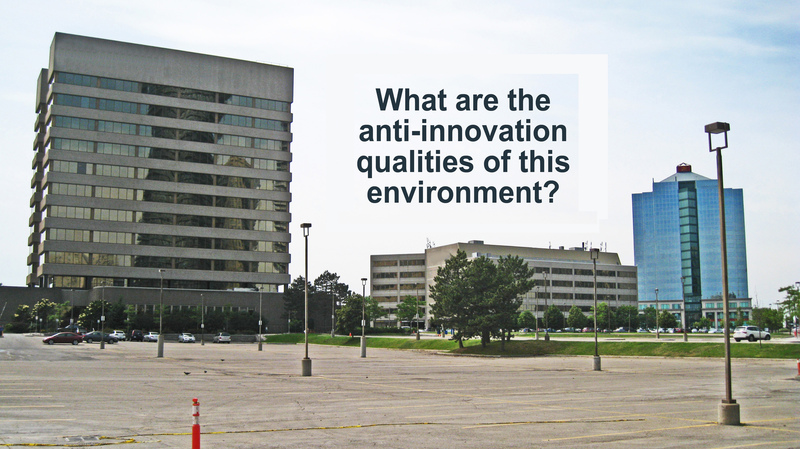 A decade or so ago it was common to see hostile – and sometimes pathogenic – parks and public spaces. I remember sitting in NYC’s Bryant Park (for a few minutes during the ’80’s) when it was scary. Decaying conditions and anti-social behavior were the norm when there was no direct involvement by each community in ongoing improvements. In recent years, new standards for civic engagement and quality have been set by such places as Bryant Park, Campus Martius in Detroit and Sugar Beach in Toronto. Rather than simply aim to “do no harm” in line with the 30+ year old “broken windows theory“, today’s best new and revitalized parks and public seating is salutogenic (v. pathogenic). 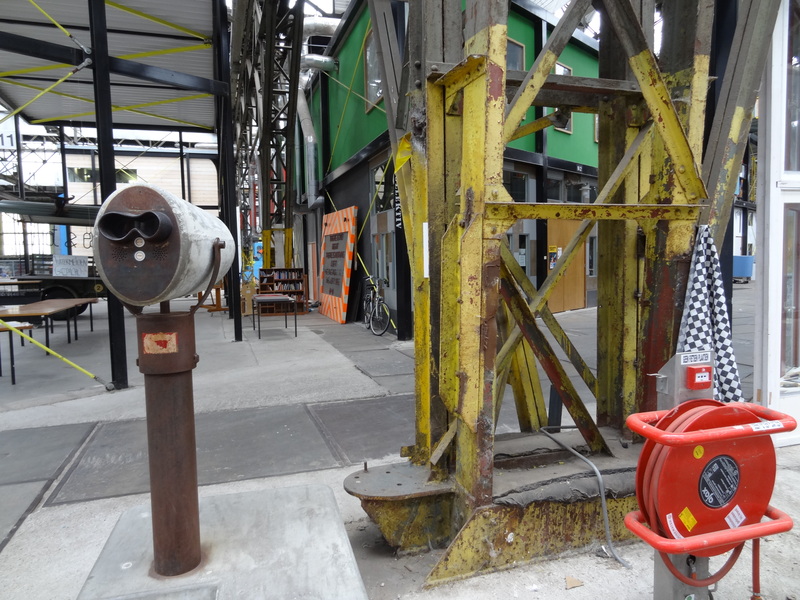 Fifteen years ago, NDSM in Amsterdam Noord was at risk of becoming a boring, generic development. Today it is Europe’s largest broedplaats (breeding ground) for makers, inventors and artisans. 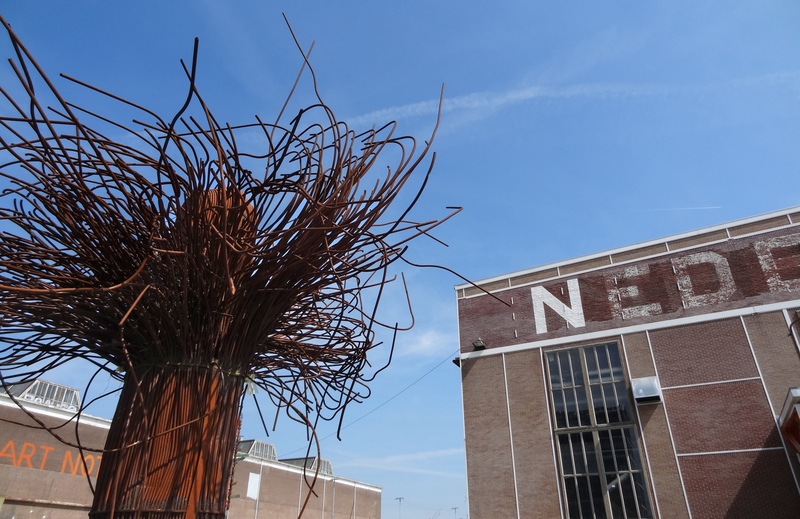 NDSM is an enormous shipyard with a second life at the heart of an emerging economy. 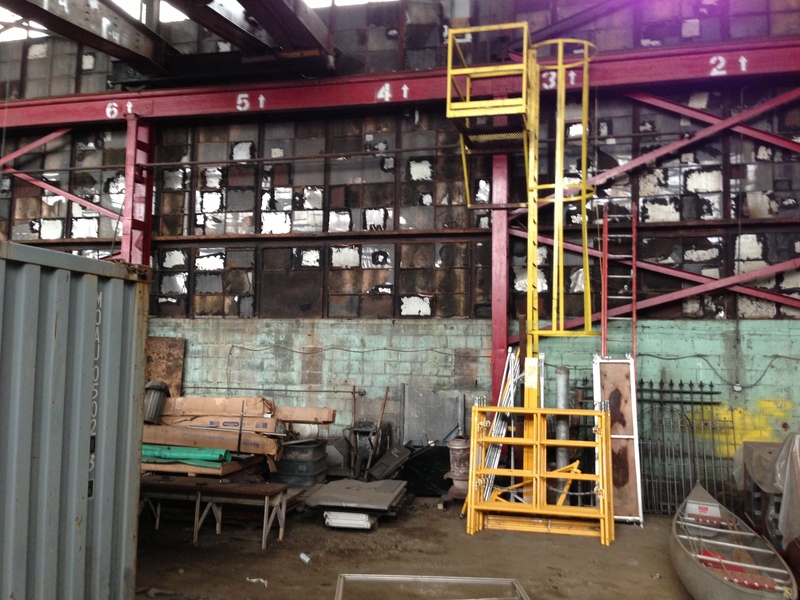 The booming era of shipbuilding at NDSM can be compared to the glory days of car building at the Packard Plant in Detroit. Workers in both cities endured hard lives in the factories, yet their jobs gave them some sense of security, purpose and belonging. While their industries were thriving, they were proud to be part of a bigger identity that gained worldwide respect. That purpose-driven work is long gone. Our need today is for new jobs that are meaningful and sustainable; in other words, the future is about making and doing things of enduring value rather than a life of empty consumption. 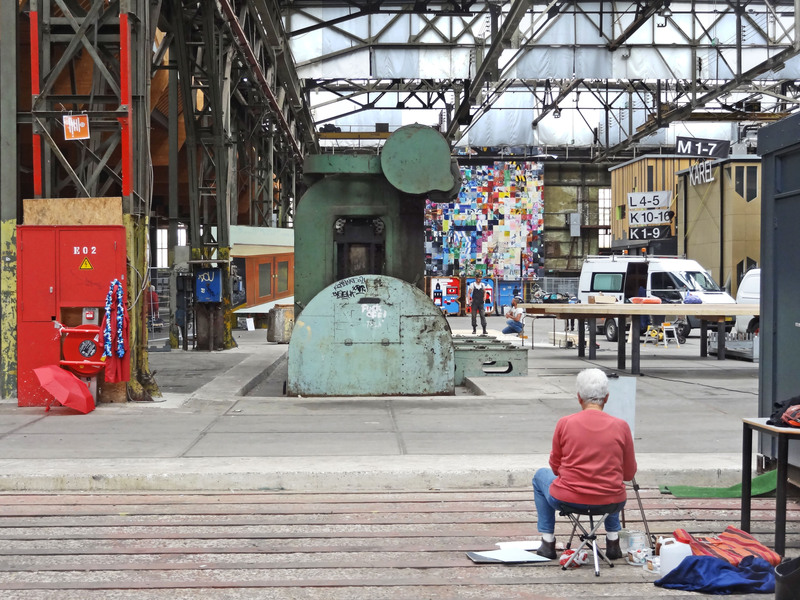 In particular, what can developers and friends of Detroit’s Fisher Body Plant, Packard and other emotionally-charged industrial sites learn from the nature of work at NDSM and other emerging models? And how can my hometown of Detroit reflect its roots as a place for inventors? What is real job security today? What is the best work setting to spark innovation? How can we aim for more than merely a sustainable environment? The polished, anonymous “office park” developments of the post-industrial era were known for killing any sense of identity while draining the creative energy out of its hapless victims. The resulting recipe for alienation, conformity, false illusion of predictability, and norm of complacency was not a recipe for innovation. 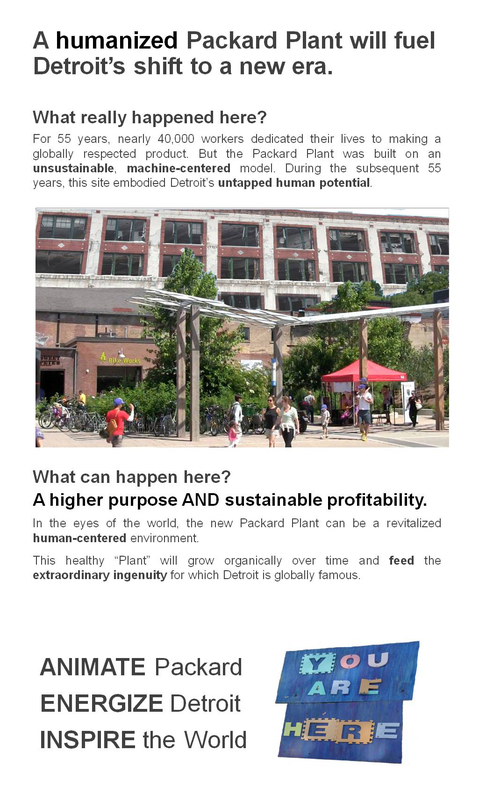 So how can a place help us thrive by creating new job opportunities, rather than to merely survive as consumers? 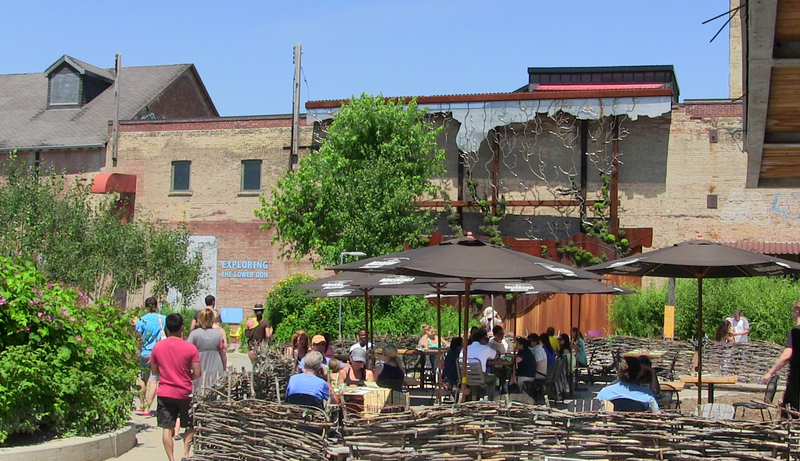 Below are five essential ingredients which draw on NDSM and the model pioneered in 1994 by Margie Zeidler at 401 Richmond St West in Toronto as well as other creative hubs such as Evergreen Brickworks. 1. ROUGH EDGES and RUST: When big new ideas are born, they are naturally messy, unpolished, imperfect and unfinished. Rough edges encourage thinking about possibilities. 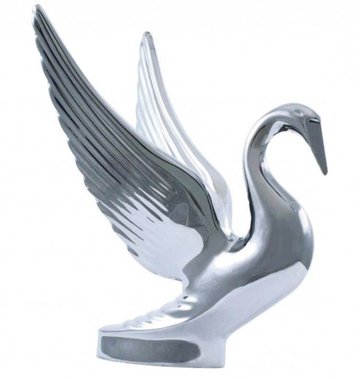 Polished places are hostile habitats for unconventional approaches. 2. ROOTS: Humans have an innate need to be part of something bigger and more enduring than themselves. Tangible historical connections have an effect on our mental health–they are not simply about being sentimental. Shiny office parks are depressing in part because they are rootless. 3. 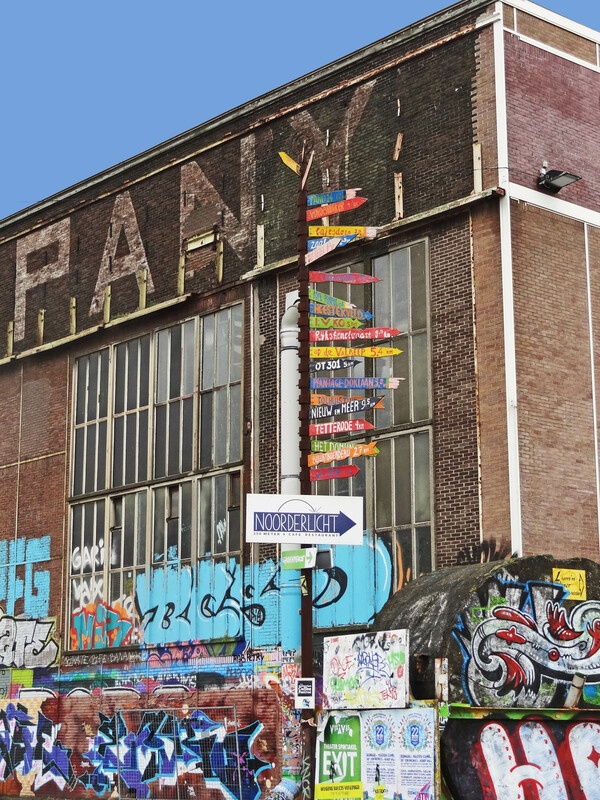 IDENTITY: The NDSM not only has its own special character, it encourages 230 creatives to express their individual identity. The design of each studio has a different personality, yet the whole effect is pulled together by strong structural elements. These expressions spill over to enliven shared spaces (which would be forbidden in an office park). 4. INTERACTION: The future of work and job security will be through human relationships and collaboration. 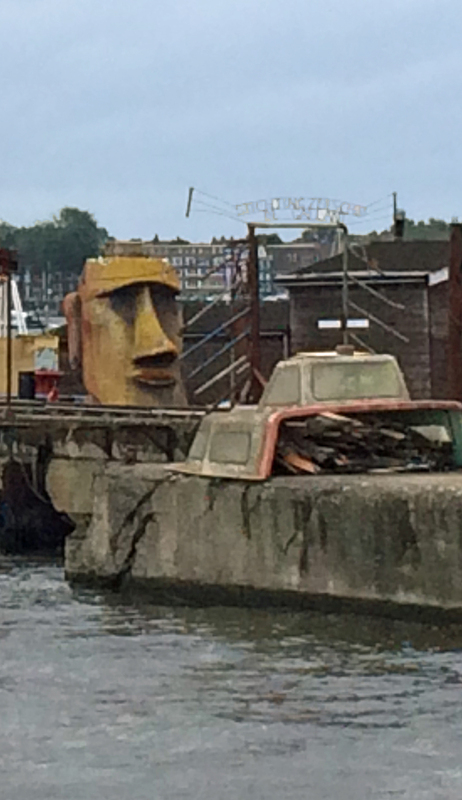 The NDSM encourages idea development and fluid work arrangements by providing a variety of stimulating, changeable spaces that attract people with shared interests. LEFT: from the Diego Rivera mural at Detroit Institute of Arts RIGHT: A face in the hood by Tyree Guyton at the Heidelberg Project, Detroit. 5. SHARED OWNERSHIP: Whether through a formal shared ownership agreement (example: NDSM) or a sense of ownership instilled by the owners (example: 401 Richmond W) it is essential that people feel they have a personal stake in something that is enduring. 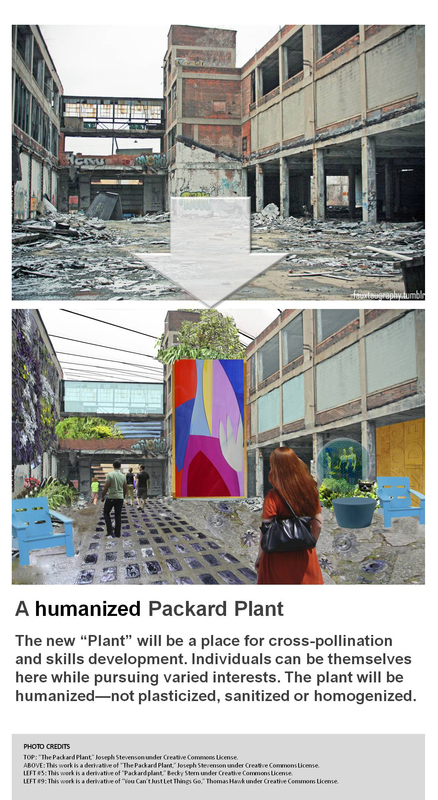 My ideas for the Packard Plant combine respect for the past with the rough edges that feed a new generation of innovators. I believe that to be a truly healthy place, it must inspire people to build their identity around things they create, not around things they consume. Recently I led a Jane’s Walk which looked at a wide range of settings in terms of how they make us feel and why. My message was that our daily visual diet affects our state of mind. We can make better choices as individuals and as a society if we become better critics. During my walk I mentioned that “building beloved places is a sustainability issue.” Up to 40% of solid waste in landfills comes from construction debris. If we aim to build places that are love-worthy, they will not be destined for demolition. A SAB Magazine article I co-wrote explores this idea in more detail. Everyone has a different “Love List.” I’ve noted in the slides above some of my reasons for choosing these particular places. What places do you love in your city? Located in downtown Detroit, this 10-story gallery-garage displays the work of 26 international artists commissioned by Dan Gilbert, owner of Bedrock Real Estate, working with Library Street Collective. “The Z” could have been just another utilitarian design in a city that needs new infrastructure. 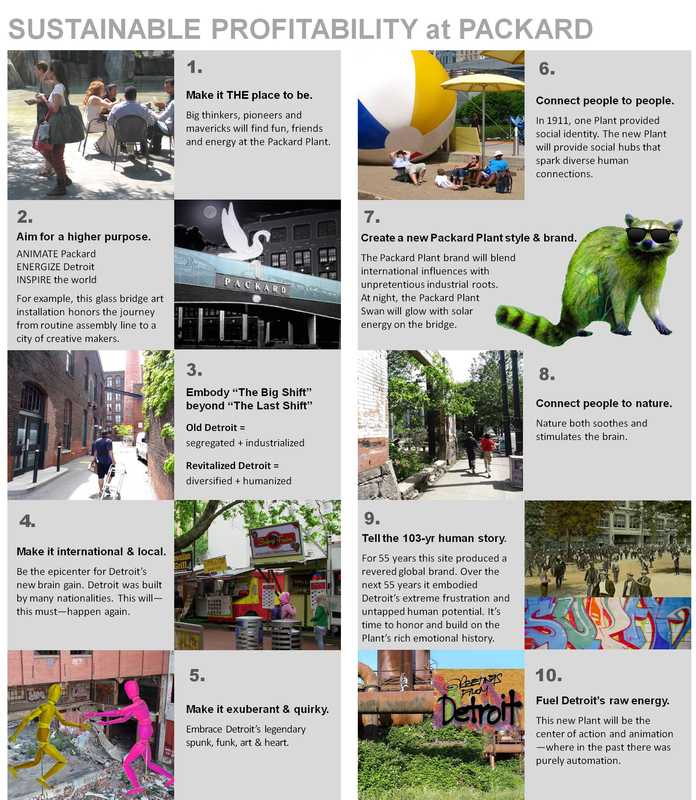 Instead the developer makes the most of this opportunity to reinforce Detroit’s image as an optimistic, intriguing and human place. My proposal honors the past while creating new symbols for the future. It draws on the world’s most advanced models for supporting new ways of working, entrepreneurship and innovation. BELOW, the ghost of an assembly line that once flowed across this bridge is etched in back-lit glass. 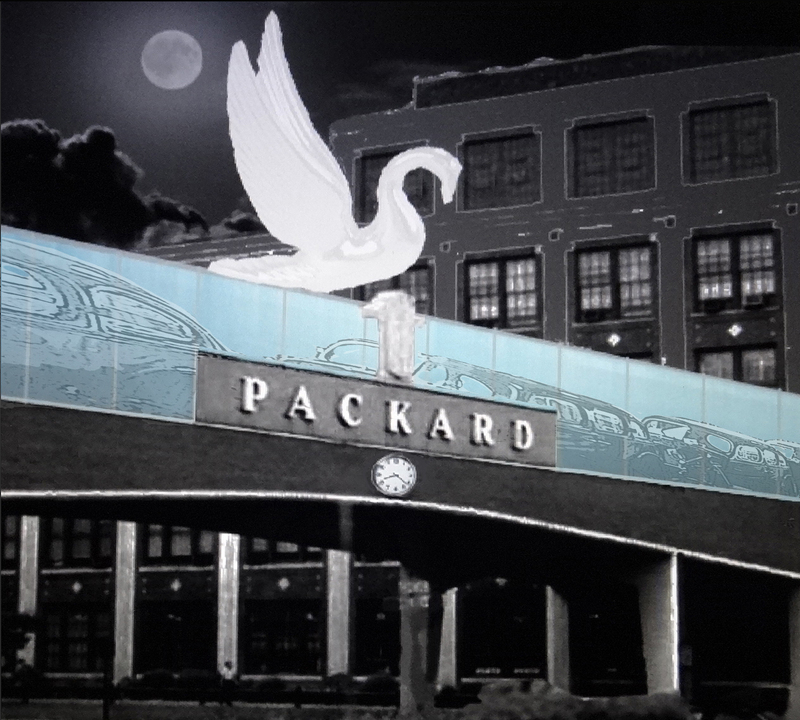 The new bridge retains the original Packard logo and keystone. 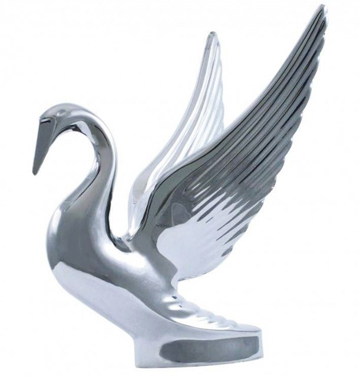 It adds a Shinola clock and creates a new symbol for the site from an oversized 1948 hood ornament. Look Around. Diagnose Your Habitat! Behold my entry for Spacing magazine’s Public Space Invaders film night. The evening of short films about Toronto and urban issues took place on Nov 26.